Stock photo of three people silhouetted against an orange sunset reflected on the lake as they walk along the beach at Agawa Bay on Lake Superior in Lake Superior Provincial Park, Ontario, Canada. 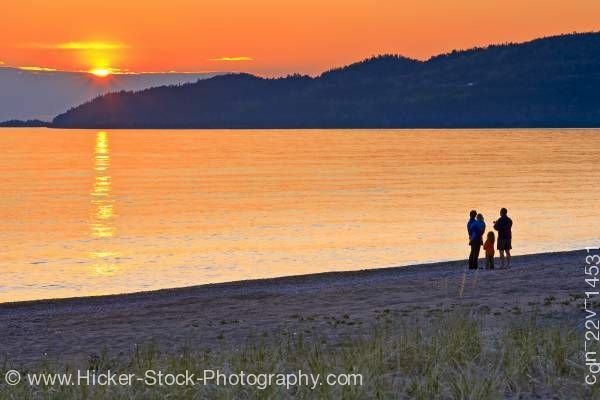 This stock photo includes two adults and a child walking along the beach at Agawa Bay at sunset, Lake Superior, Lake Superior Provincial Park, Ontario, Canada. Agawa Bay can be fairly busy during the summer months as tourists come to this stunning location to camp and enjoy the outdoor activities which Ontario has to offer. The beach extends for three kilometers along the shoreline of Lake Superior which is very attractive to visitors who like to enjoy the tranquility at sunset as they stroll the beach. Lake Superior is a spectacular place to visit while in Ontario, Canada but nothing can replace the view from the beach at Agawa Bay of the colors that adorn the horizon at sunset.